How Do I Decide Which FTP Program to Use? Please click the brand that best represents your FTP needs. In order to start uploading files you will need to already have an FTP program, use our Online tools or download an FTP program. Download a Program: Open the search engine of your choice and search for an FTP client application. 1. Click here and login to the Account Manager. 2. Hover over the Hosting tile and click Manage. 3. Click the FTP icon. 4. Expand FTP & Content Publishing. For complete File Manager instructions, please click here. Open the search engine of your choice and search for an FTP client application. How Do I Start Uploading Files Using FTP? 1. Connect to your FTP application—Enter your FTP Server name, user name, and password. 2. Click Connect or OK in your FTP application. 3. Find the files on your local computer that you want to upload. Then drag and drop files to the /htdocs folder or to the sub folder to which your domain name is assigned. On Windows 2008 servers, the root folder is labeled www and not htdocs. If you purchased a Windows hosting package after 9/6/2012 you are on a Windows 2008 server. 1. Ensure that you have assigned your domain name to the appropriate hosting package. 2. The root directory for the website is /HTDOCS, this is the default directory where your website must be uploaded. On Windows 2008 servers the root folder will be labeled www and not htdocs. If you purchased a Windows hosting package after 9/6/2012 you are on a Windows 2008 server. 3. If you have assigned the domain to a sub folder of HTDOCS or WWW, be sure to upload your files to your specified folder. 4. UNIX® based nsHosting™ packages are case sensitive. Be careful when using capital letters in filenames. 5. Make sure your home page is an approved file name. The most common file name for your home page is index.html. 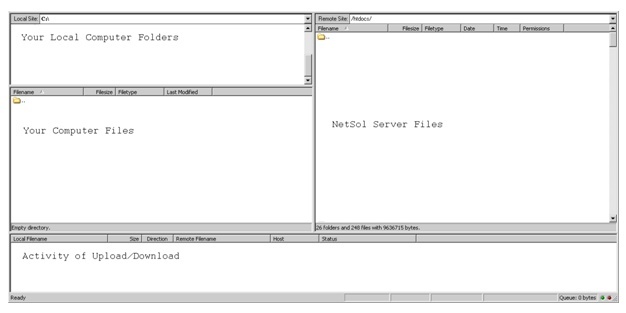 Network Solutions—How Do I Get Started with the File Manager? Network Solutions—How Do I Set Up My FTP? Network Solutions—How Do I Upload My Custom CGI Script?